As the end of the election is upon us, I thought it would be fun to take a look and see how the current statistics of player data were going in The Political Machine 2016. We have ‘Exit Polls,’ which consist of data that we collect from the game on things such as what candidates people are playing as, what party is winning in games, what issues are deciding the wins, and more. You can see all the data here. So lets take a look and see where we’re at with this data at the end of the election. Not real surprising, but Trump takes the lead with about 13%, Sanders with 9.6%, and Clinton with 7.6%. This is a great chart to look at, and I recommend visiting the site to see more, but this is from the last 3 months. The last month is interesting as the games between Trump and Clinton increased, and while many were very close, Trump has taken a small lead just recently. Issues are obviously a big part of campaigns in and out of the game, so now we can see what the top issues have been for the winning campaigns. Fighting ISIS continues to be at the top of the list at 40.9%. 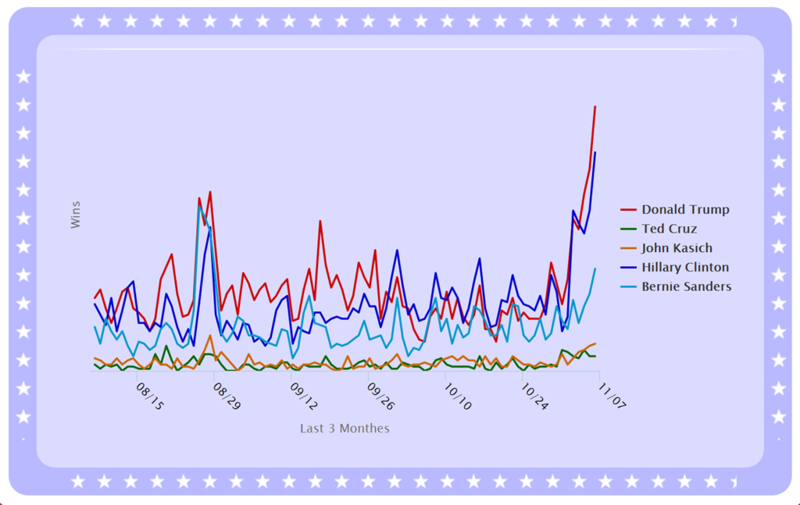 This has been the top issue in games since I’ve been watching this data, which is interesting as it didn’t seem to get that much attention in the actual presidential campaigns. Refugees have been a big topic in the actual campaigns, so no surprise that it’s been at the top with 20.4%. Securing the borders, the wealth gap, and gay marriage finish out the top 5. It’s been fun watching this data and seeing how it reflects in the real campaign with the issues that have been discussed. Even though the election is winding down, you can still continue to play out your own elections with The Political Machine 2016. Learn more about The Political Machine 2016 here.